Broadcasting live from ONE5 Lakeside restaurant, during the Lake Las Vegas Annual Tree Lighting Ceremony, Andy and Sean Ray (Event Director, The Village Lake Las Vegas) attempt to get Tony “Paul Bunyan” Cordasco to ride the flyboard like Santa. 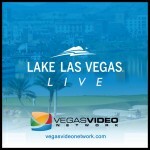 Also joining the show where Daniel Pfeiffer (Executive Chef, Hilton Lake Las Vegas), Dan Smitherman (President, Excellence Promotion Agency) and Heather Williams (Director of Development, LV Rescue Mission). Don’t forget to drop off a sweater for the Dasco Sweater Drive, till January 1, 2019, at participating Lake Las Vegas locations!